Why CenturyLink, Amazon, and Applied Materials look like good bargains right now. With indexes bumping along at record highs, it can be hard to find stock bargains these days. The challenge is tougher still in the tech sector, which isn't known for serving up screaming buy opportunities to investors. But our Motley Fool contributors have identified a few promising prospects that may be flying under Wall Street's radar right now. Read on to find out why the market is grossly underestimating Amazon.com (NASDAQ:AMZN), CenturyLink (NYSE:CTL), and Applied Materials (NASDAQ:AMAT). Anders Bylund (Amazon.com): Yes, I know. Amazon shares trade at 170 times trailing earnings and would not be considered a value play by most investors. Even the forward P/E ratio seems steep at nearly 67. But those traditional at-a-glance valuation measures do a terrible job of weighing Amazon's actual value. The stock is actually terribly undervalued today, leaving lots of room to build a position before the market really catches on. You see, Amazon happens to be an extremely efficient cash machine under the cover of an equally effective tax-reduction strategy. The company recorded $16.4 billion in operating cash flows in 2016, yielding $9.7 billion of free cash flows after subtracting Amazon's capital expenses and lease prepayments. Thanks to large chunks of non-cash operating costs, mostly reported as depreciation expenses and stock-based compensation, Uncle Sam only saw $4.2 billion of operating profits. So the tax bill came in at a measly $1.4 billion, leaving $2.4 billion of bottom-line GAAP earnings -- which is the starting point for those nosebleed P/E ratios. 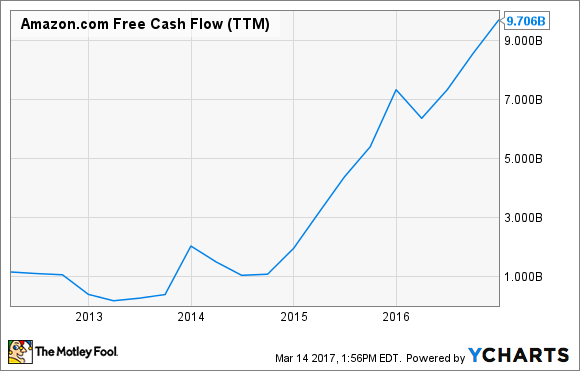 AMZN Free Cash Flow (TTM) data by YCharts. In that light, Amazon's stock isn't expensive at all. The global e-commerce platform provides a stable financial base, from which the Amazon Web Services division is taking a flying leap. That technology service saw annual sales rising 55% higher in 2016, while operating profits more than doubled. AWS now stands for just 9% of Amazon's total sales -- but 74% of its GAAP operating profits or 51% of the adjusted operating line. Yes, Amazon is a legitimate tech stock. No, it isn't ridiculously expensive. It is, in fact, a fantastic deal right now. Someday, market prices will catch up with Amazon's true cash-making prowess, and you don't want to miss out on that hockey-stick moment. Steve Symington (CenturyLink): It's hard to blame CenturyLink investors for bidding shares of the telecommunications leader down nearly 30% over the past year. After all, its legacy voice and low-bandwidth data services businesses have continued to decline, more than offsetting growth from its newer strategic revenue streams. And there's plenty of uncertainty surrounding CenturyLink's impending acquisition of Level 3 Communications (NYSE:LVLT), which, given the deal's $34 billion enterprise value, is more a merger of equals than anything else. But I've already argued that this merger could be a fantastic driver of shareholder value. For one, Level 3's nearly $10 billion in aggregate net operating losses should significantly improve the combined company's free cash flow, which will offer financial flexibility and help CenturyLink fulfill its expectation of maintaining its seemingly lofty dividend (which yields an uncomfortable 9.3% as of this writing). And by combining their respective massive fiber networks, CenturyLink and Level 3 will enjoy obvious benefits of scale, as well as significant cost synergies by focusing capital investments on increasing capacity and extending that network's reach. CenturyLink also expects to generate $975 million in annual run-rate cash synergies through operational efficiency and similar measures after the deal closes in the third quarter of this year. All the while, CenturyLink continues to position itself to drive incremental revenue as a leading IT services and cloud solutions provider. Most recently, we saw this effort progress with the launch of its new Cloud Application Manager aimed at wooing enterprise clients who want to simplify deployment of workloads, managed services, and third-party cloud resources across hybrid hosting environments. As it stands, with shares trading around 11 times this year's expected earnings, I think long-term investors willing to endure CenturyLink's period of transition could be handsomely rewarded for their patience. Demitri Kalogeropoulos (Applied Materials): Applied Materials stock has rallied lately as a surge in orders for its core semiconductor systems sent revenue and earnings to new highs. Yet, in my view, the current valuation of less than 20 times last year's earnings and 3.5 times sales doesn't fully reflect its improving business outlook. The tech materials specialist gained significant market share last year even as the foundry, memory, and logic industries enjoyed a major cyclical upswing. That's great news for the business, but there are even more exciting gains happening beyond these areas that constitute Applied Materials' traditional strength. Display technology is just one promising example. The division has grown at a 20% pace each year since 2012 and is set to pass $2 billion of annual revenue soon as demand for OLED manufacturing capacity soars. Looking further out, shareholders are likely to see Applied Materials benefit from major long-term investments by tech giants into applications like virtual reality, autonomous vehicles, and more powerful consumer electronics. All of these trends will require key advances in just the type of fundamental silicon, memory, and display technologies that Applied Materials, and its $1.5 billion annual R&D budget, can provide. As its growth segments grow to take up a bigger portion of revenue, I'm expecting the business to become both more profitable and less cyclical over the next few years, which could make it an attractive buy for tech investors shopping for growth at a reasonable price.